Enjoy an evening of great music and fellowship. Our gospel music show is the longest running live gospel music venue in Wood County. 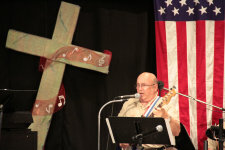 Cross County Line Gospel Jubilee features gospel music from traditional to southern gospel. If you enjoy tapping your foot and clapping your hands to great gospel music and laughing to clean humor then you will enjoy our program. Our program is a ministry and we operate on a love offering basis. We want to reach as many people as possible to share the message in song. Please bring your friends and enjoy the music, testimony and fellowship. Every program will be different. We are enhancing our concessions for this year at very reasonable prices.